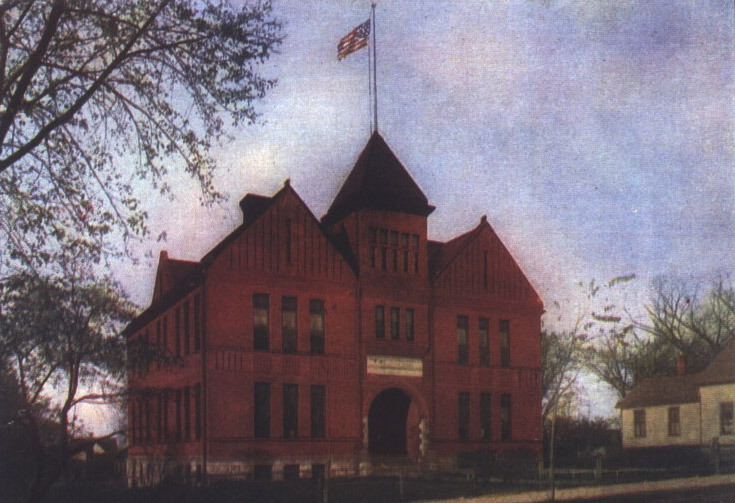 The Eugene Field School depicted on the circa 1905 postcard published by the Rock Island Postcard Co.
bears no resemblance to the present Rock Island school of that name. This school, known as P.S. No. 5, reportedly cost $11,000 when it was built in 1890 to serve the 5th Ward. Designed by architect Edward Hammatt, who designed many other Rock Island Schools of the era, it was located on the north side of 7th Avenue between 28th and 29th Streets. The school property extended the length of the block all the way to 6th Avenue. The site is now the home of the International Brotherhood of Electrical Workers. The pictured school replaced an 1880 school at the same site that had been deemed unsafe only nine years later. Many postcards from early in the 20th century appear to have their source in “Picturesque Tri-Cities,” a subscription photo series that was published monthly during 1902-04. The picture on this postcard appears in that series, mistakenly identified as Irving School, while the school identified as Eugene Field School in that publication is probably the real Irving School. The flag atop Eugene Field does not appear in the original photo, but was a drawn-in addition to the postcard. Around the turn of the previous century, there were nine public grammar schools and a high school, mostly located on an east-west line between 7th and 42nd Streets. All were located in Rock Island Township, and students residing in South Rock Island were required to pay tuition to attend. During the same time, there were as many as six parochial grammar schools, Lutheran and Catholic, also in the same vicinity. In 1897, the school board decided that schools should be named after “deceased men of letters.” Teachers and pupils were allowed to vote on names for their school. This was the era when many Rock Island schools received names that endure today – although attached to different buildings: (Henry Wadsworth) Longfellow, (Nathaniel) Hawthorne, (Washington) Irving — poets and authors all. A few political or military men slipped in, too – (Abraham) Lincoln, (Ulysses S.) Grant, and politician/educator (Horace) Mann. Even a former Superintendent of Schools, Samuel S. Kemble, was honored by having P.S. No. 3 named for him. That school on 5th Avenue near 19th Street no longer exists. Fortunately for feminist prohibitionist Frances Willard, her namesake school was built much later. Otherwise it would likely have been named for a man. This Eugene Field School was abandoned for educational use in 1937 and sold. It was used as a church and parsonage for the Grace Apostolic Church from 1939 until 1941, when it was destroyed by fire. But the name is still present in Rock Island in the “new” Eugene Field School on 31st Avenue and 29th Street, which opened for the 1949-50 school year. Eugene Field School continues to educate our city’s children.